UBC Okanagan Human Kinetics student Paige Marzinzik high fives a young boy during her last visit to Haiti. Paige Marzinzik has been on the run for several months now. Marzinzik is a fifth-year UBC Okanagan Human Kinetics student who plans to run across the island nation of Haiti in late February. For the past few years, she has accompanied her mother, a nurse who has volunteered at a Haitian medical clinic since the 2010 earthquake. Last year Marzinzik learned about a new fundraising effort where volunteers ran some 350 kilometres across the island. The young runner was excited by the idea. Organized by an American non-profit group called Team Tassy, participants raise money by running across the country during a multi-day event. Team Tassy is named after a young boy Tassy, who happened to catch a ride in the same pick-up truck as run organizer Ian Rosenberger shortly after the 2010 earthquake. Tassy had a cancerous lump on his face, and Rosenberger realised that while the world was helping the earthquake-stricken country, there would be no specific help for this child. Rosenberger began a fundraising campaign and was eventually able to take Tassy to America for life-saving surgery. Six years after the earthquake, the need is still there and Rosenberger and volunteers have turned the run into an annual event. Marzinzik, who is a full-time student and also works as a trainer with the UBC Okanagan Heat women’s volleyball team, couldn’t think of a better way to get involved. 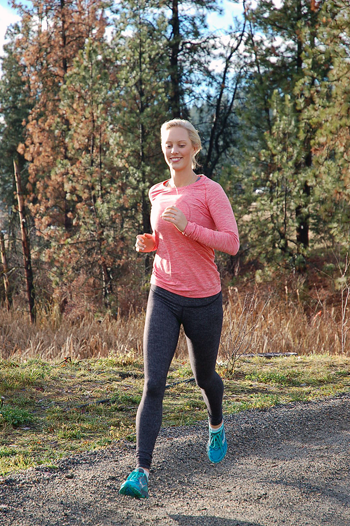 UBC Okanagan Human Kinetics student Paige Marzinzik runs several times a week, building up her mileage for next month’s Run Across Haiti. Run Across Haiti starts in the northern tip of the island and concludes at the southern end of Haiti. The miles will range from 15 to 30 each day with a double marathon, more than 84 kilometres, to the finish line on the final day. This will be her third trip to Haiti, but her first time participating in the run. Before classes ended for the winter break at UBC Okanagan, Marzinzik’s longest run hadn’t been more than 30 kilometres. She’s slowly working on a mileage increase, and with the help of UBC Okanagan’s athletic therapist Jeff Thorburn, she’s optimistically confident that she’ll be ready for the run. With a few weeks left to complete her training, Marzinzik is busy juggling her studies, her work with the volleyball team, and fundraising. No matter how many blisters, sore toes, or running shoes she goes through, the thought of helping the people of Haiti will motivate her to keep on going. Funds raised during this year’s event will help provide health care and education to Haitian families. Paige Marzinzik leaves for Haiti with her mother, Amanda, on February 18. She has an online Crowdrise fundraising page set up and the Okanagan community is encouraged to donate to her run at: www.crowdrise.com/paigemarzinzikrunacr.